In doing so, yesterday I came across another FACE stone w/ a huge nose!? Checkout the photo-bucket pics... direct slideshow link below. It was just turning low tide and it was laying sideways staring at me...a little creepy,,,but true. 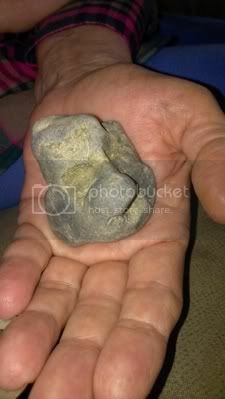 (LOL) Ironically, I know how my daughter felt when I couldn't see it because still today my mom sees just "a rock" So can u prove me wrong and help settle this dispute. I'm thinking Nanticoke Lenni-Lenape artifact what do you think? Well....disappointing. Thanks for your time. Anyway maybe I will upload a few more pics and get the forum opinion. Previous topic: "1 yr Masters UK degrees - What are your thoughts"